Today, Republican candidate Bruce Rauner confirmed he would participate in eight gubernatorial debates and candidate forums ahead of the November election. "The public knows virtually nothing about Republican billionaire Bruce Rauner and he wants to keep it that way. In limiting the number of debates to a paltry three, he is hiding from a transparent airing of his views and plans for Illinois,” she said in a statement. "This is unworthy of a candidate for governor and a disservice to the people of Illinois. Mr. Rauner won't let us know about his finances. He won't let us know about the shady dealings of his business. “He won't let us know about his foreign investments and partnerships. He won't let us know about the exotic vehicles he uses to dodge Illinois and U.S. taxes. In the 2010 election, Republican nominee for governor Bill Brady readily agreed to five debates without condition. By hiding from debates about the future of Illinois, Bruce Rauner is letting us know one thing: he wants to hide from the judgment of the people. By doing so, Mr. Rauner is disrespecting Illinois voters." 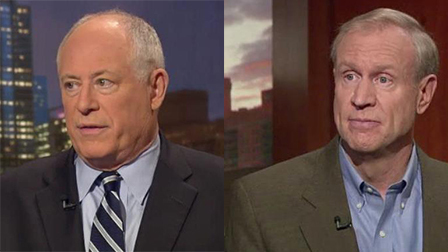 Quinn and Rauner will only face off in three debates, with first scheduled for Oct. 9 and hosted by the League of Women Voters/PBS Peoria. Both also agreed to appear at the Oct. 14 event hosted by the Urban League and Business Leadership DuSable Museum and the Oct. 16 League of Women Voters/ABC 7 Chicago debate.